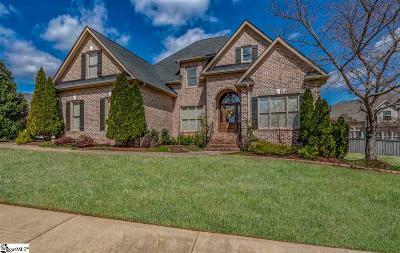 This Stunning Custom Brick Home in Desirable Five Forks Plantation Neighborhood is one you will want to call YOURS! Conveniently located off Woodruff Road, the home sits on a Beautifully Landscaped Lot. You will be AMAZED at all the upgrades and detail in this home! Desirable features include Formal Dining Room with custom wainscoting; Gourmet Kitchen with Island, 42" Cabinetry, Double Wall Oven, and Granite Countertops; Great Room with Stone Fireplace and Coffered Ceiling; GORGEOUS office with Beautiful Planked Wood Ceiling. The Master Bedroom features Huge Walk-in Closet w/ Shelving and Spa-like En-suite Bath including His & Hers Vanities, Jetted Tub, and Large Tiled Shower. 3 Large Additional Bedrooms (+ BONUS) and 2 Full Baths make space for everyone! Home includes Built-In Surround System in Bonus Room, Living Room, and Porch. One of the BEST parts of the home is the outdoor area. A Screened-In + Open Air Deck provides the perfect place for outdoor relaxation and entertainment! This is a home you will truly have to see to believe!